This magnetron was most likely made in the years 1942-1945. The two Magnetrons are very similar in appearance. Outwardly discernible features of the two Magnetrons are an anode block, two filament leads and an output connection. The cylindrical anode block has copper end plates attached and also has metal cooling fins. The output connection comes out of the curved surface of the anode block and is joined with a copper thimble to a small glass evacuated space through which a tungsten lead travels, stopping approximately 1 cm beyond the glass tube. The two filaments have similar connections to, but on the opposite side from, the output. At the end of the glass tubes the filaments turn into wires (one of the wires is broken on Magnetron 138) and finally into small plugs. 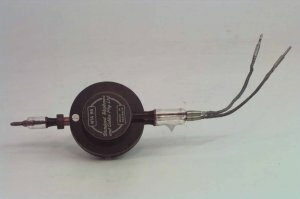 Internally, the two filament leads are attached to the cathode which runs through the center of the anode. The cathode is likely a nickel tube coated with an emission mixture, heated by a spiral of tungsten wire. The Magnetron is a device designed to emit microwave power ( wavelength 10cm) through the output. It does this by placing a potential difference between the anode and the cathode and crossing this with an externally provided magnetic field. The electrons emitted by the heated cathode form a hub of rotating charge which interacts with cavities in the anode block to cause resonances and the conversion of electric potential energy to electromagnetic radiation. This type of Magnetron was used in W.W.II for radar and communications.